Pope Francis has named 18th-Century missionary Junipero Serra a saint, in a move cheered by Hispanic Catholics but criticised by some Native Americans. Serra, who lived in what is now California, is the first person to be made a saint in the US. Latino churchgoers have said honouring him is an overdue acknowledgment of the American Church's Hispanic history. However, Native American groups have accused him of helping wipe out indigenous people and their culture. Serra was a Franciscan friar who brought Christianity to California. Native Americans there say he was instrumental in the killing of thousands of people by the Spanish conquerors. But his defenders insist he worked as a moderating influence. The Pope, who is on his first official visit to the US, defended Serra saying he helped protect native peoples. 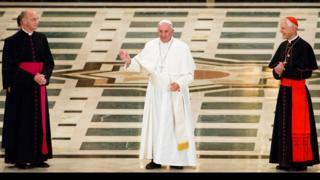 "[Serra] was the embodiment of a Church which goes forth," the Pope said on Wednesday. "Today, like him, may we be able to say: Forward. Let's keep moving forward. " The Pope - speaking in his native Spanish - made the announcement during a Mass in Washington attended by about 25,000 people. The Pope had "fast-tracked" his canonisation, meaning that there was no need to show proof of two miracles. Earlier, the Pope called for further action on climate change saying that it was "a critical moment of history", on the first day of his visit to the US. Speaking at the White House, he said the problem could "no longer be left to a future generation". President Barack Obama said the Pope reminded people "that we have a sacred obligation to protect our planet". The environmental issue is divisive in the US, with one Republican congressman boycotting the Pope's speech to Congress on Thursday because of the pontiff's stance. All the leading Republican presidential hopefuls say tackling climate change will hurt the economy. At the White House large crowds gathered on the South Lawn to greet the pontiff. Officials said over 11,000 tickets had been issued, but noted that the crowd was even larger. After the Pope spoke, he held a private meeting with the president at the White House Oval Office before the Pope embarked on a parade in a specially outfitted jeep known as the "Popemobile". He will also visit New York and Philadelphia. The pontiff, who has sought to bring Catholics back to the Church with a more inclusive message, is very popular in the US and is expected to draw massive crowds. Francis - the first Pope to hail from Latin America - is from Argentina. He arrived in the US on Tuesday, after his first visit to Cuba. Are you in Washington DC, New York or Philadelphia? Are you planning on seeing the pontiff?